As someone who has been living with a rather gnarly case of obsessive-compulsive disorder for part of my adult life, I know what it’s like to be alone, scared and turning to CAMH’s emergency room for help. It turns out that living in a major city like Toronto can be more harmful to your mental health than researchers first thought. A 2015 Stanford study mapped the brain activity of participants who walked for 90 minutes through an urban setting and compared it to those who walked for 90 minutes through grassland covered with trees and vegetation. Those who walked in nature showed significantly lower activity in the subgenual prefrontal cortex. This area of the brain is closely associated with rumination – cyclical thoughts that don’t go anywhere in our brains and are a key contributor to depression and anxiety. Studies dating back to the 1930s have shown a higher incidence of mental illness in cities compared to rural areas. Some have theorized that the increased rates are a result of sociological factors. Newer studies suggest that the physical urban environment has a direct impact on our brain activity. According to the Stanford study, people living in urban centres are at risk for spending a greater amount of time in this cognitive trap. But the good news is that even mild increases in exposure to nature can result in better mental and physical health, including variables like the number of trees on your block. And Toronto is a fairly decent city to live in in this regard. In 2015, a team of researchers studied the impact of tree cover on Toronto residents’ mental and physical well-being. The researchers found that areas with more trees showed lower rates of depression and better physical health. Moreover, the results transcended socioeconomic factors. Poorer neighbourhoods with good tree cover showed lower depression scores and better overall health than some wealthier neighborhoods with fewer trees. Last year, researchers out of the University of Queensland in Australia were able to demonstrate that just one 30-minute trip to a park was enough to lower depression. Toronto makes it easy to visit a park. If there aren’t any parks or green spaces near you, a free shuttle bus can take you where your need to go. In 2010, a group of outdoor enthusiasts created Parkbus, an initiative focused on increasing accessibility to nature. Their free shuttles run from 30 Carlton to Rouge Park and numerous other nature-filled destinations. But despite the low cost of nature therapy, it is an under-emphasized aspect of modern psychiatry. This might be part of a long-running trend in the profession, according to Robert Whitley of the Social Psychiatry Research and Interest Group in Montreal. The biological components of psychiatry can’t be ignored, but rather professionals should give equal attention to all three components of the model. “I’m definitely not saying people shouldn’t take their medication and go sit in a beautiful garden all day,” says Whitley. It might seem that time, however, is the biggest factor preventing more people from increasing their exposure to nature. Raja Raudsepp, an environmental educator with the Toronto and Region Conservation Authority, says giving yourself a simple goal, is a good way to start. For her, the activity of choice is birding at Tommy Thompson Park. “Getting into birding is a great way to move your mind’s focus from something internal that may cause you stress to something outside of yourself in nature that you can connect with and that may relax you,” she says. Nature is a medication with few negative side effects (bears), but the best part is you don’t need anyone to prescribe it for you. 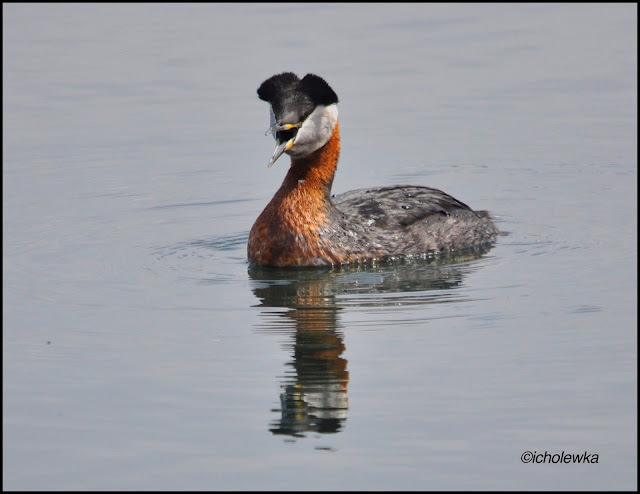 Col. Sam Smith Park has waited a long time for the successful breeding of the Red-Necked Grebes. The past couple of years have been great for them as nesting platforms have been put out, and the Grebes happily built their nests with great success in producing young. This year is a tale of sadness and loss of hope. Mid March, platforms were put out (one was left over the winter in the water) and the Grebes were happily swimming in the waters. The Grebes were calling and choosing their mates. 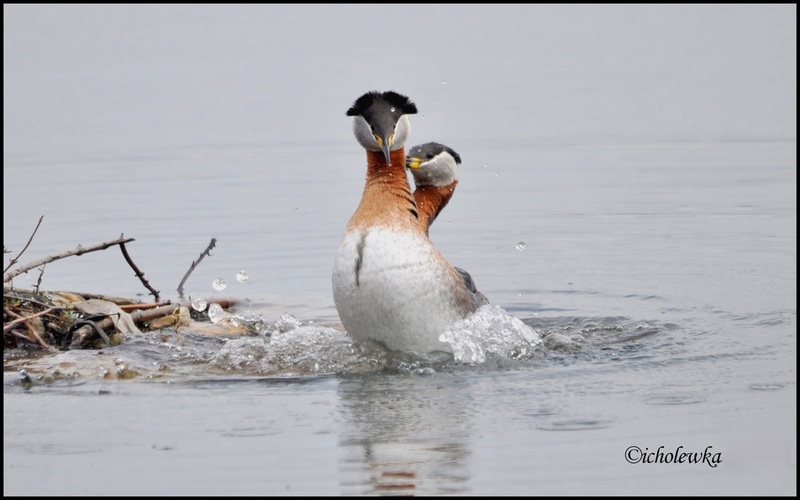 I started watching for the mating where she lowers her head in submission to the very end when the male does his success dance on the water. It truly is a great sight to see. Nest building went on this year as every year and then the rains came, and the nests were washed out and tossed about by the winds and waves. But they are determined and they rebuild another nest until a Double Crested Cormorant decides he likes the platform and disassembles the nest (the one with the orange ball). He sat there for almost 4 days. I was becoming disheartened. People were booing him, shooing him, telling him to get off the platform. It wasn’t his! 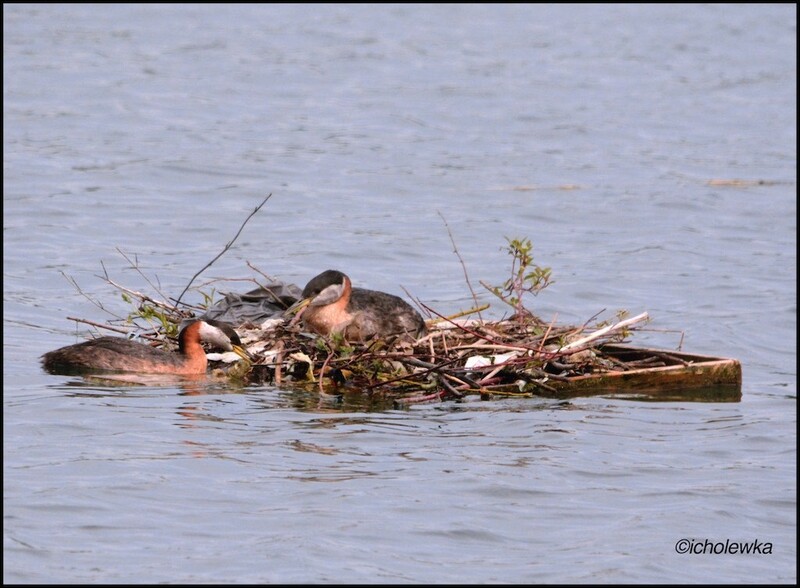 Once again our determined Grebes rebuild their nest. Maybe the 3rd time is a charm. 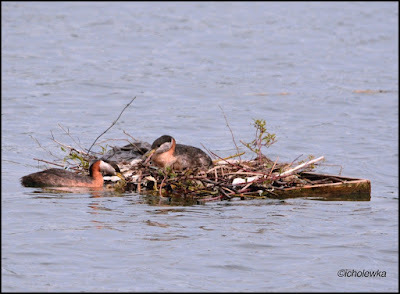 I’m not sure how the Grebes got their nest back but they did! 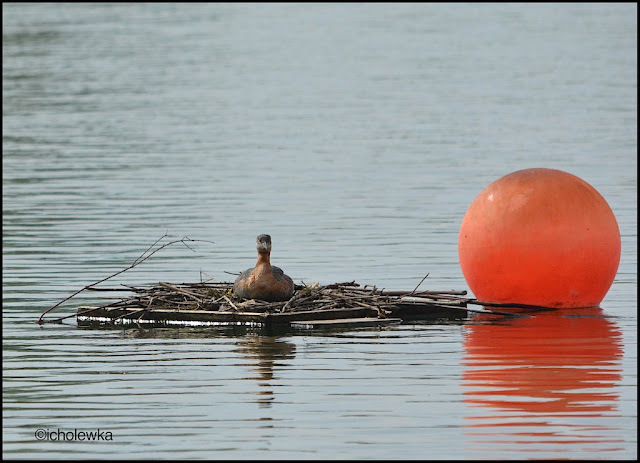 From approximately the 2nd week of June till that last week in July, she sat, and sat, patiently waiting for a hatch – we weren’t even sure there was an egg. But she was defiant, stubborn and waited patiently. 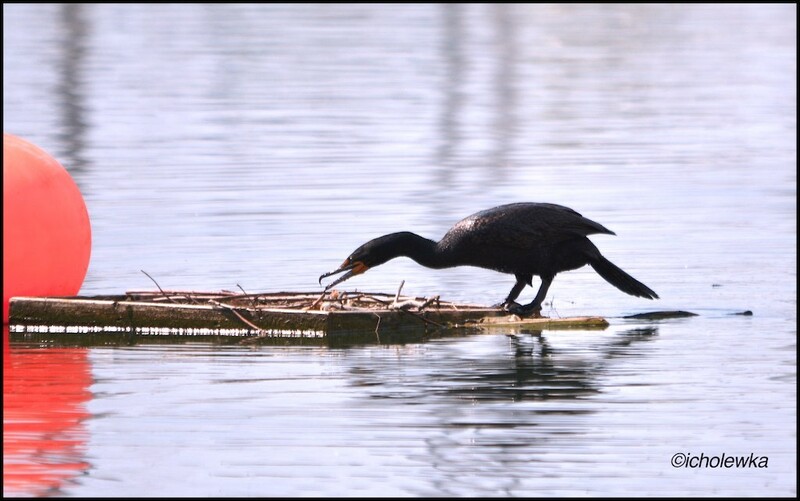 She didn’t even give that Cormorant a change to get on the platform! The last few days of July I went down to the park, and found all Grebe platforms abandoned and, of course, no babies. My heart sank. I have to give them credit though. They are stubborn, resilient and very determined birds and I am hoping for a more successful year next summer. 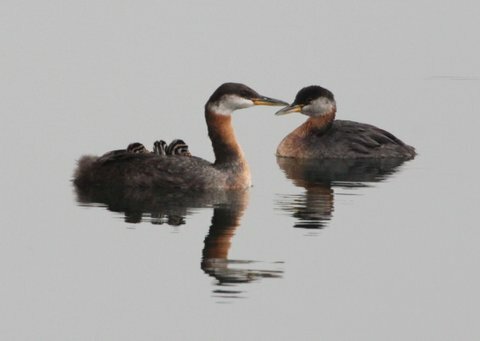 I will be watching again as I do every year in hopes of seeing young Grebes in our beautiful park.